You are viewing the ebooks tag archive. I have to admit it — I’m a Wattpad newbie. Even though this online story-sharing community has been around since 2006, it’s stayed on the edge of my radar, something I’d always planned to investigate further if I met a lot of teens who were into it. Then, I heard about Anna Todd’s After series and its beginnings as a Wattpad story with one billion — billion! — reads on the site. Clearly, readers were into Wattpad, and I needed to find out more. In perfect timing, I read on the Hub about YALSA’s Twist Fate Challenge, a partnership with the Connected Learning Alliance, DeviantArt, National Writing Project, and Wattpad. The Feb. 18 webinar, “Storytelling and Making Redefined: Get to Know the Wattpad Community,” is available to view online, and features input from Jing Jing Tan, the Community Engagement Lead at Wattpad, as well as Kassandra Tate, a teen Wattpad user with over 21K readers. Breaking news – There has been a technological revolution where kindles, e-books, and various online reading apps have taken over the world. Well, not exactly… But with today’s technological advancement it seems as though the popularity of reading books online has dramatically increased. In fact, according to a 2012 survey by Pew Research Center, the average number of books read by a reader of e-book is 24 books compared to 15 books for those who only read print. 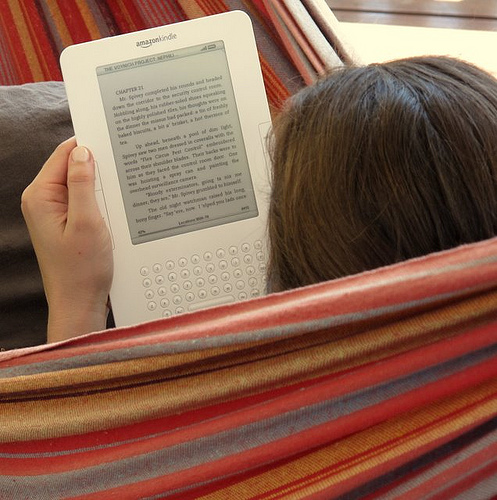 What makes reading an e-book more popular than reading a print book? I plan to evaluate the pros and cons for both types of books. October is an exciting month for any YA lit fan, because it includes Teen Read Week! In honor of this annual celebration of young adult literature, YALSA invited book-loving teens all over the world to apply to share their enthusiasm for reading in a guest post for The Hub. Thirty-one talented young writers were chosen, and we’ll be featuring posts from these unique voices all month long. Here’s Courtney Kilroy from Nebraska. I… am not a fan of ebooks. Never have been, possibly never will be. Why? If you’re reading this, you must be a dedicated reader. Of anything. Newspapers, magazines, novels, chapter books, graphic novels, manga, et cetera. Why else would you be reading a blog about books?? And if you’re a dedicated reader, you know how exciting it is when your favorite author releases a new book, or when the next issue of your favorite magazine hits the shelves. And the build-up that makes it exciting. The cliffhanger left at the end of the last book. The nine months you waited until the title and sneak peek were released. The additional month you waited until the book actually was available in stores. The drive to the bookstore. The speed-walk to the young-adult fiction aisle. Then… you see it. You hold it in your hands, and you flip through the pages. You have the thing you’ve been waiting for what seems like forever. replace the bookstore with a library. Anyway, I feel like you don’t get that with an ebook. The cliffhanger at the end of the last book. The nine months you waited for the title and sneak peek to be released. The additional month you waited until the book was actually available in the iTunes Store. The opening of the iTunes app. The typing of the name of the book into the search bar. The clicking on the book’s icon. Kind of anticlimactic, don’t you think? 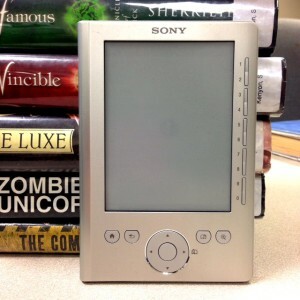 Continue reading eBooks? No Thanks. Part of the fun of reading YA is discovering the classics from a time other than when you were a teen yourself. What girl hasn’t felt a little bit dirty, a little bit relieved, when first discovering a Judy Blume title? And who wasn’t assigned to read a classic novel from the 17th or 18th century in high school and found that it wasn’t totally awful? Who didn’t like a line or two of Shakespeare once they learned the definition of a new word and figured out the pun? Reading books that are no longer contemporary can be rewarding and challenging, and especially in the world of YA, it allows you to fully participate in the conversation about what YA means, how the definitions of “teen” and “young adult” evolve, and how current authors draw their inspiration from the authors of earlier YA. That’s why reissues of novels are common. All you need is a cover that represents current trends in design, and you have new readers who will pick up your book for the first time. But what happens when the reissue isn’t just a facelift? I recently read some ebooks by some of those classic, before-I-was-a-teen authors that I still read as a teen (and am clearly reading again now, as an adult), Lois Duncan and Caroline B. Cooney. They are part of a company of authors for all ages, including the Berenstains, Lawrence Durrell, and Zilpha Keatley Snyder, being republished in e-book form by Open Road Media, a company that says it does quick turnaround and innovative marketing to bring entire backlists to life in 90 days. I think this is a great idea. What a great way to introduce these authors to new readers and to allow tried and true fans to complete their collections! But as I was reading, I realized that they weren’t just reissues. They were rewrites. On Saturday, November 3, attendees at the YALSA YA Literature Symposium had the chance to talk about book discussions that take place from right inside an ebook. That’s right, you can talk about books from right inside the book. No more going to a website like GoodReads or Twitter or Facebook to have your discussions. E-books are not the Next Big Thing. They spent several years as the Next Big Thing, but now that e-reading is possible on cellphones and tablets as well as computers and e-readers, they are officially a Very Big Thing and have been for awhile. What’s still just beginning to be explored, though, are the possibilities that e-publishing holds for enhancing the reading experience. Some writers and publishers are exploring interactive creations, such as hidden clues and puzzles for readers to find on-line, game tie-ins, interactive maps and more; there’s even a term, “transmedia,” for this kind of experience which connects reading with other activities. However, there’s another Next Big Thing spawned by e-reading — it’s less technologically intensive than transmedia, but still has the potential to change how we read. I was sitting around a table with about 12 teenagers at my library. We were going around and telling each other what books we were reading or had just finished reading — when, to my utter astonishment, two girls started talking about YA books that I hadn’t heard of. What?! This can’t be! Seriously, I go to the YA section in bookstores and libraries (even in other countries — see photo below) and scan the shelves … then I think to myself, “Yep. Yep. Seen it. Bought it. Own it. Read it.” This is because I am lucky to work for a medium-size library with a generous budget for teen materials. I spend around $500 a month selecting and buying all the latest and greatest! So, what, pray tell, were these girls talking about? Could Self-Published Ebooks Be The Next Big Thing? In just a few weeks we will all celebrate the publication of the last book in the Inheritance Cycle by Christopher Paolini. This series has been a long time in the making and has taken more than a little elbow grease from the author, who wrote the first draft of Eragon at the ambitious age of fifteen. What some may not remember about the illustrious history of this series is that it began as a small homegrown project from a family publishing house. Paolini took several years to plan and write what would finally become Eragon with the support of his parents. When most people would be finishing high school, Paolini was finishing his final draft, which his parents read and agreed to publish through their small family press, Paolini International. After 135 visits to schools, libraries and bookstores around the county with little success, Eragon came to the attention of Carl Hiaasen who, in turn, introduced it to the publishing house Alfred A. Knopf. After another round of editing and new cover, Eragon was rereleased in 2003 to quickly move onto the New York Times Children’s Books Best Sellers list and stay there for 121 weeks! A decade later, readers are drawn to another self-published author, Amanda Hocking. 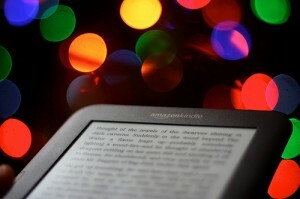 Continue reading Could Self-Published Ebooks Be The Next Big Thing?